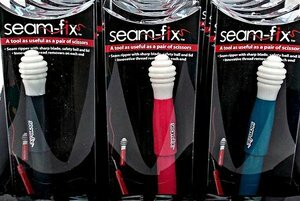 We are excited to offer you the Seam Fix Mini Seam Ripper/Thread Remover. The new mini size, only 5-1/4" long, is available in assorted colors. The Innovative rubber thread remover on the cap makes ripping seams and removing threads so easy. Just rub it on your fabric like an eraser to move your threads out easily. The Mini size is great for travel to classes and retreats. Seam Fix - Seam Ripper with Thread Remover. A tool as useful as a pair of scissors. Seam Ripper / Thread Remover. With sharp fine blade and Safety Ball. The important thing about Seam-Fix is the plastic that "grabs' and removers the thread without sticking or gluing itself to the fabric.